Bogmother is an ancient Argonian ruin, located deep in the bogs of Shadowfen, southwest of Stormhold. It was once a temple village, and some of the intricate carvings can still be seen on its towers and the monumental stepped pyramid (or Xanmeer). 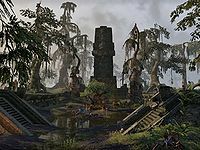 The area is still sacred to the Argonians, and hosts several venerable relics.